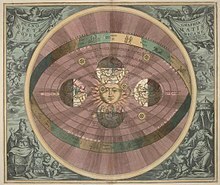 Heliocentric universe, Harmonia Macrocosmica (1660). Cosmology is the study of the origins and eventual fate of the universe. Physical cosmology is the scholarly and scientific study of the origin, evolution, structure, dynamics, and ultimate fate of the universe, as well as the natural laws that keep it in order. Religious cosmology (or mythological cosmology) is a body of beliefs based on the historical, mythological, religious, and esoteric literature and traditions of creation and eschatology. Every time we get slapped down, we can say, Thank you Mother Nature, because it means we're about to learn something important. This quote was Bahcall's response to the ongoing controversy about which new observation will eventually "tie up the loose ends in cosmology?" In the beginning, the establishment of first ties between general relativity and astronomy was a tedious exercise involving only a small number of bridge builders, most notably Freundlich, Karl Schwarzschild, Willem de Sitter, Arthur Eddington, Georges Lemaître, and Edwin Hubble. [T]wo rather separate research agendas emerged...  investigations of what were to become the three classical tests, envisaged by Einstein as early as 1907. ... investigations of cosmological issues, whose only observational basis was the redshift observations. Of the classical tests, both the bending of light and the gravitational redshift remained controversial matters until the renaissance... This research agenda involved a small number of astronomers... not necessarily focused on general relativity. The cosmological research involved a separate group, consisting mostly of mathematicians like Howard Robertson and Cornelius Lanczos and astronomers with strong mathematical training such as Eddington, Lemaître, George McVittie, and William McCrea. They were mainly interested in how to apply general relativity to cosmological problems, which involved not only understanding cosmic dynamics but also solving the intricate problem of interpreting cosmological solutions to the Einstein equations, in particular separating time (which determined the evolution of the universe) from space (to which simplified assumptions concerning the structure of the universe, such as homogeneity and isotropy, were to be applied). The fine-tuning of the universe, about which cosmologists make such a to-do, is both complex and specified and readily yields design. So too, Michael Behe's irreducibly complex biochemical systems readily yield design. The complexity-specification criterion demonstrates that design pervades cosmology and biology. Moreover, it is a transcendent design, not reducible to the physical world. Indeed, no intelligent agent who is strictly physical could have presided over the origin of the universe or the origin of life. While in the ﬁrst quarter of this century physicists and cosmologists were forced to revise the basic notions that govern the natural sciences, in the last quarter of this century biologists will force a revision of the basic notions that govern science itself. After that “ﬁrst revolution” it was clear that the classical concept of an “ultimate science”, that is an objective description of the world in which there are no subjects (a “subjectless universe”), contains contradictions. One may wonder, What came before? If space-time did not exist then, how could everything appear from nothing?... Explaining this initial singularity—where and when it all began—still remains the most intractable problem of modern cosmology. Take a look at George Gamow, who is now recognized as one of the great cosmologists of the last hundred years. I speculate that he probably didn't win the Nobel Prize because people could not take him seriously. He wrote children's books. His colleagues have publicly stated his writing children's books on science had an adverse effect on his scientific reputation, and people could not take him seriously when he and his colleagues proposed that there should be a cosmic background radiation, which we now know to be one of the greatest discoveries of 20th-century physics. Michio Kaku, in "Borrowed Time : Interview with Michio Kaku"
Dirac spent the autumn term of 1931 at Princeton University, where Robertson was a professor. During his stay they got to know each other well. Most likely they discussed cosmology, a science which at the time was experiencing dramatic changes. Helge Kragh, Masters of the Universe: Conversations with Cosmologists of the Past (2014) footnote, p. 230. Guth... wanted to hear... Alex Vilenkin... describe a new theory of the origin of the universe, of how it could have emerged from nothing. Vilenkin's version of the infant universe... was a kind of metaphysical mole. ...a bubble of universe, space-time, had "tunneled" into a Wheeleresque superspace of possible space-times and then tunneled again into "real" space and time. ...But from where had the universe tunneled into this realm..? In Vilenkin's words, "from nothing." ...Vilenkin's tiny bubble... inflated and went through the standard expansion and evolution of the big bang. ...he, Guth, and Sidney Coleman sat and had a conversation that Lewis Carroll might have enjoyed, about nothing. ..."Nothing," answered Vilenkin... "is no time, no space." ..."There is an epoch without time," [Coleman] said finally as the shadows lengthened. "It is an eternity. So we make a quantum leap from eternity into time." Simple rules can have complex consequences. This simple rule has such a wealth of implications that it is worth examining in detail. It is the far from self-evident guiding principle of reductionism and of most modern investigations into cosmic complexity. Reductionism will not be truly successful until physicists and cosmologists demonstrate that the large-scale phenomena of the world arise from fundamental physics alone. This lofty goal is still out of reach. There is uncertainty not only in how physics generates the structures of our world but also in what the truly fundamental rules of physics are. Physics has entered a remarkable era. Ideas that were once the realm of science fiction are now entering our theoretical — and maybe even experimental — grasp. Brand-new theoretical discoveries about extra dimensions have irreversibly changed how particle physicists, astrophysicists, and cosmologists now think about the world. The sheer number and pace of discoveries tells us that we've most likely only scratched the surface of the wondrous possibilities that lie in store. Ideas have taken on a life of their own. We should, of course, expect that any universe which expands without limit will approach the empty de Sitter case, and that its ultimate fate is a state in which each physical unit—perhaps each nebula or intimate group of nebulae—is the only thing which exists within its own observable universe. If the general picture, however, of a Big Bang followed by an expanding Universe is correct, what happened before that? Was the Universe devoid of all matter and then the matter suddenly somehow created? How did that happen? In many cultures, the customary answer is that a God or Gods created the Universe out of nothing. But if we wish to pursue this question courageously, we must of course ask the next question: where did God come from? If we decide that this is an unanswerable question, why not save a step and conclude that the origin of the Universe is an unanswerable question? Or, if we say that God always existed, why not save a step, and conclude that the Universe always existed? That there's no need for a creation, it was always here. These are not easy questions. Cosmology brings us face to face with the deepest mysteries, questions that were once treated only in religion and myth. Carl Sagan, Cosmos: A Personal Voyage (1980), Ep. 10: "The Edge of Forever"
The primary challenge of this cosmological transformation of consciousness is the awareness that each being in the universe is an origin of the universe. "The center of the cosmos" refers to that place where the great birth of the universe happened at the beginning of time, but it also refers to the upwelling of the universe as river, as star, as raven, as you, the universe surging into existence anew. The consciousness that learns it is at the origin point of the universe is itself an origin of the universe. The awareness that bubbles up each moment that we identify as ourselves is rooted in the originating activity of the universe. We are all of us arising together at the center of the cosmos. Cosmologists have plenty of ego — how can a person not be ego-driven when it's your job to deduce what brought the universe into existence? But without data, their explanations were just tall tales. In this modern era of cosmology, each new observation, each morsel of data wields a two-edged sword: it enables cosmology to thrive on the kind of foundation that so much of the rest of science enjoys, but it also constrains theories that people thought up when there wasn't enough data to say whether they were wrong or not. No science achieves maturity without it. Neil deGrasse Tyson "Let There Be Light". Natural History Magazine. October 2003. Retrieved on 2010-12-07. Our mistake is not that we take our theories too seriously, but that we do not take them seriously enough. It is always hard to realize that these numbers and equations we play with at our desks have something to do with the real world. ...The most important thing accomplished by the three-degree radiation background in 1965 was to force us to take seriously the idea that there was an early universe. Robert Woodrow Wilson Conclusion of his Nobel lecture (December 8, 1978) emphasizing that every new experimental discovery increases significantly our knowledge. This page was last edited on 29 July 2017, at 19:26.